Chances are, if you're researching outdoor ice makers, you plan to invest in one. Outdoor ice makers are a great way to get the party going and keep the cool drinks coming. But what are the benefits of owning an outdoor ice maker? This buying guide has the answers you'll need to maximize your outdoor ice maker knowledge, and make an educated decision about which ice maker is right for you. One reason you decided to build your amazing outdoor kitchen or patio space was for entertaining friends and family. There are many occasions that call for parties and celebrations, such as holidays, weddings, anniversaries, and more. For these special gatherings, an outdoor ice maker will ensure you will always be able to serve your guests with fresh, cold ice for drinks and cocktails. While relaxing in your cozy outdoor space, imagine the convenience of having your own outdoor ice maker, allowing you to easily keep making those cool drinks. After all, who wants to keep making trips to the store or indoors every time you want to make a drink? Outdoor ice makers offer several different ice type options. From delicious sonic-style nugget ice, to gourmet ice that's perfect for cocktails, and traditional cube and crescent ice, you'll always have the type of ice you like most on-hand and ready for your glass. Where will I place my outdoor ice maker? Will you be installing your ice maker as a built-in application in your outdoor kitchen, or will it be stand-alone? Before you start shopping for an outdoor ice maker, it is important to know where you plan to locate it. Knowing where it will be installed will help ensure you purchase an ice maker that's the perfect size and type for the space you have available. If you plan on building your ice maker into an outdoor kitchen island, it is import to consider how the ice maker vents, as well as its cutout dimensions. Most outdoor ice makers are front vented, meaning that no extra spacing is needed around the ice maker for ventilation in your island cutout, as the ventilated air is blown directly out of the front of the appliance. If you already know your islands cutout dimensions for the ice maker, you will need to find an ice maker with the proper width, depth, and height dimensions to ensure it fits properly into your island cutout. Rear vented ice makers vent from the back side of the appliance. If you plan on installing a rear vented ice maker into your outdoor kitchen island, you should take into account the extra spacing needed in your island cutout for proper ventilation, that is set by the manufacturer. Many customers add island vent panels in the rear of their island to increase air flow. Another consideration for the best placement of your ice maker should be the outdoor elements. As with any outdoor appliance, it is best to have your ice maker in a dry, covered area, avoiding any exposure to harsh weather and direct sunlight to prevent any future performance issues. If you are looking for an ice maker that is designed to better withstand the outdoors, then an outdoor rated ice maker should be considered. Outdoor Rated ice makers undergo a series of tests for durability to be approved and warrantied for outdoor use. How will I drain my outdoor ice maker? 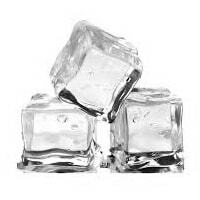 Most ice makers will need a way to drain condensation and melted ice, as the majority of ice bins are not refrigerated. There are typically three drain options when it comes to outdoor ice makers: gravity drains, drain pumps, and self-contained (no drain required). If your ice maker will be located above a drain, then a gravity drain will be the right choice. Gravity drains use the force of gravity to pull the drainage downward, emptying out of the appliance and into your outdoor drain. If your outdoor ice maker will not be located closely to a drain, or if the water will not be draining in a downward direction, then a drain pump option is best. This type of drain, pumps the water out of the ice maker and into a nearby drain. Some outdoor ice makers do not need drains, and are self-contained, such as most crescent ice makers. How much ice will I need my outdoor ice maker to produce and store? It's very important to consider the ice production rate and ice storage capacity of an outdoor ice maker before you buy to ensure you get a model that meets your needs. Ice usage is rarely consistent even with the same amount of people attending events that you host. Ice use may vary greatly from a gathering in the summer, than in the winter. The chart below is dedicated to giving you a rough idea of how many drinks an ice maker will serve, depending on its ice storage capacity. It is important to remember that results may vary depending on preference. What types of ice cubes do I want? Do you have a favorite type of ice? For some people, any ice will do as long as it keeps your drink cold. However, for the ice connoisseur, outdoor ice makers come in a variety of models that produce several different types of ice. Below are the most common ice types available. 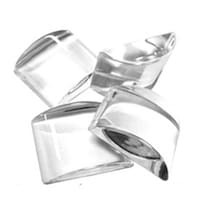 Sometimes called clear ice or dice-cube ice, cube ice is square in shape with no indentations, allowing more ice mass to chill drinks better. This ice is produced more commonly with high-end ice machines, and is often featured as one of the ice type selections. Cube or Dice ice measures between 1-1/8" - 7/8" along each side, depending on the brand of ice maker. Typical of many home refrigerator ice makers. It is a common, easy shape for an ice maker to produce. Crescent ice cubes are long with a flat top and round, or "crescent" bottom. Nugget/sonic-style ice, sometimes called Sonic ice ®, is more crude in shape than most ice. However it is convenient to form since it requires no real shape mold. 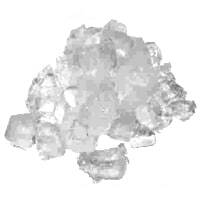 This ice is typically shards off of the blades, and is used by many commercial businesses. Nugget ice is usually softer than cube or crescent ice and is favored by most people because it is easy to chew. 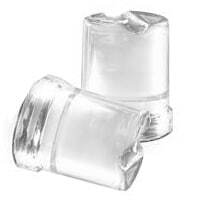 Larger than most cubed ice, gourmet ice has a distinct top-hat or thimble shape. This ice is comprised of almost entirely water making the ice nearly crystal clear, and extremely effective at cooling drinks. The unique shape and rapid cooling properties of this ice make it popular among high-end restaurants and bars. Outdoor ice makers typically cost in the range of $1,000 - $4,000. Many ice makers in the upper end of that range are built with a higher quality and offer higher ice production rates and capacity than more afforable ones. Another factor that may affect the price of an outdoor ice maker is the brand's reputation, whether it's outdoor rated, and the extra features it offers, such as drain type, water filter, and ability to make gourmet or nugget/sonic ®-style ice.